The crimes and sins punished at each of the 9 Circles of Hell were also explored in Book One (“Hellfire & Damnation”), but there are many choices at each Circle, and others may be chosen for other collections. In other words, there are no recurring characters and the settings and points-of-view will differ from collection to collection and story to story. There are also illustrations for each story and a From the Author section at the end that gives the inspiration for each story. This particular story is also based on my own Norweigan grandfather, who did, in fact, emigrate to America and help lay the B&O railroad. The Circle illustrated is Limbo. I hope you enjoy the excerpt. “Limbo. An indefinite state. A condition of neglect or oblivion. In some Christian theologies, the term applies to infants who die before being baptized. But I am not an infant. I am a full-grown man. I came to this godforsaken Colorado town of Neverland from Norway in 1880. To have stayed in my native land would have meant compulsory service in the Army. I did not want to go to war. “I have heard that there is gold mining in a place called Colorado. I might try that. If that doesn’t work out, I can use my telegraph skills. Or I could work on the railroad. The B&O Railroad is hiring day laborers.” I packed my things and left the next day. I had studied telegraph code and learned the intricate series of dots and dashes needed to send messages, via telegraph, in Oslo. I traveled from Bergen to learn the Morse code I would need as a telegraph operator. And so it was that I came to the small town of Neverland, just northwest of Denver, and learned of the pit that, mysteriously, was as cold as Norway. As cold as Antarctica. As cold as a witches’ heart. I learned of its subterranean frigid temperature because I was incautious. Curious, I climbed down into the pit. Just as I reached the bottom, a large boulder broke loose from above. It fell into the pit, crushing me. I have been dead in this small town for over one hundred thirty-two years. When the residents discovered that I had climbed into the pit and had been crushed by a falling boulder, they chose to preserve me in a simple casket. They made futile efforts to contact my parents. My parents would not have had the money to have me shipped back to Oslo. Sending bodies back to the Old Country is not for the faint of heart. It is time-consuming. It is expensive. Corpses do not travel well without refrigeration. In my day, refrigeration was not so advanced. After all, a dead body is simply a dead body. Except for my dead body. My cold corpse. I am unique. I am undead. I do not know why, but it is so. I am simply in limbo. In suspended animation. In a state that is neither life nor death. 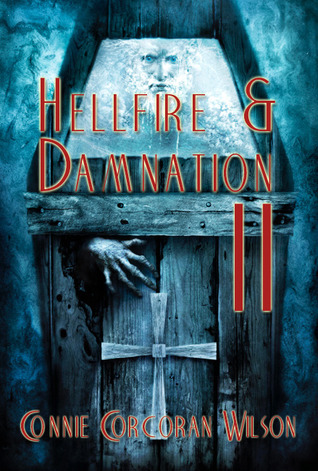 FREE on Kindle on October 27 – 31 as part of the launch of “Hellfire & Damnation II” and in honor of Halloween. Connie (Corcoran) Wilson (MS + 30) graduated from the University of Iowa and Western Illinois University, with additional study at Northern Illinois, the University of California at Berkeley and the University of Chicago. She taught writing at six Iowa/Illinois colleges and has written for five newspapers and seven blogs, including Associated Content (now owned by Yahoo) which named her its 2008 Content Producer of the Year . She is an active, voting member of HWA (Horror Writers Association). Her stories and interviews with writers like David Morrell, Joe Hill, Kurt Vonnegut, Frederik Pohl and Anne Perry have appeared online and in numerous journals. Her work has won prizes from “Whim’s Place Flash Fiction,” “Writer’s Digest” (Screenplay) and she will have 12 books out by the end of the year. 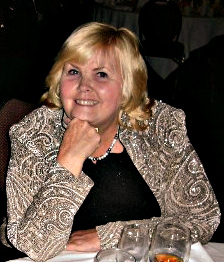 Connie reviewed film and books for the Quad City Times (Davenport, Iowa) for 12 years and wrote humor columns and conducted interviews for the (Moline, Illinois) Daily Dispatch and now blogs for 7 blogs, including television reviews and political reporting for Yahoo. Connie lives in East Moline, Illinois with husband Craig and cat Lucy, and in Chicago, Illinois, where her son, Scott and daughter-in-law Jessica and their three-year-old twins Elise and Ava reside. Her daughter, Stacey, recently graduated from Belmont University in Nashville, Tennessee, as a Music Business graduate and is currently living and working in Australia. Thanks so much for taking part in the tour!